What Type of Brow Lift is Right for You? Cosmetics and other beauty products work well to create a youthful appearance but can only do so much when making a person look rejuvenated and rested. An increasing amount of people are opting for surgical brow lifts, which work to tighten the skin, reduce wrinkles, and make eyes appear larger, shedding years off of the face. For each candidate, there are many different types of brow lifts to consider when determining where the incision should be made, as well as the type of look it will create. It mainly depends on the hairline of each individual and the type of look they want to obtain. Also known as an open brow lift, this type of brow lift is the most common type with a single continuous incision made behind the brow line from the ear, which can lift the hairline a bit. This is typically the most ideal type of lift for women with a smaller forehead. This type of lift is more advanced with a small camera inserted into one of the incisions for the surgeon to view the inside tissue with ease. Incisions are made above the hairline for an advanced way to lift the brows without cutting the skin from ear to ear. It not only creates more natural looking results, but includes a faster healing time. Temporal brow lifts, also known as lateral brow lifts, differ as they’re a more minimal procedure that specifically works to improve the outer one-third portion of the eyebrows for a more gentle treatment that enlarges the eyes. Local anesthesia is used for this type of lift, often done with an endoscopic lift for an improved look with less down time. Small incisions are made with a lower amount of risk involved. Most ideal for patients with higher hairlines, this lift involves an incision that is only four centimeters long with anesthesia used during the cosmetic procedure. In this case, the hairline does not move, but rather skin is removed to elevate the eyebrows with an incision discreetly made in the hairline. 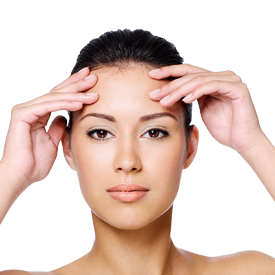 Not only will trichophytic lifts reduce wrinkles on the forehead, but it also easily lifts the eyebrows.